1. The Ronald McDonald House Charities has given RM11mil to underprivileged children since its establishment 24 years ago. Question: How much has the Malaysian Muslim Consumers Association (PPIM) given to charity? 2. McDon­ald’s Malaysia had been contributing to the Malaysian economy by providing jobs for 12,000 employees. Question: How many of these employees will the Malaysian Muslim Consumers Association (PPIM) employ or find jobs for equivalent to their current position, salary and benefits? SURELY, IF YOU’RE PLAYING DEAD, YOU’RE GOT TO KEEP STILL! 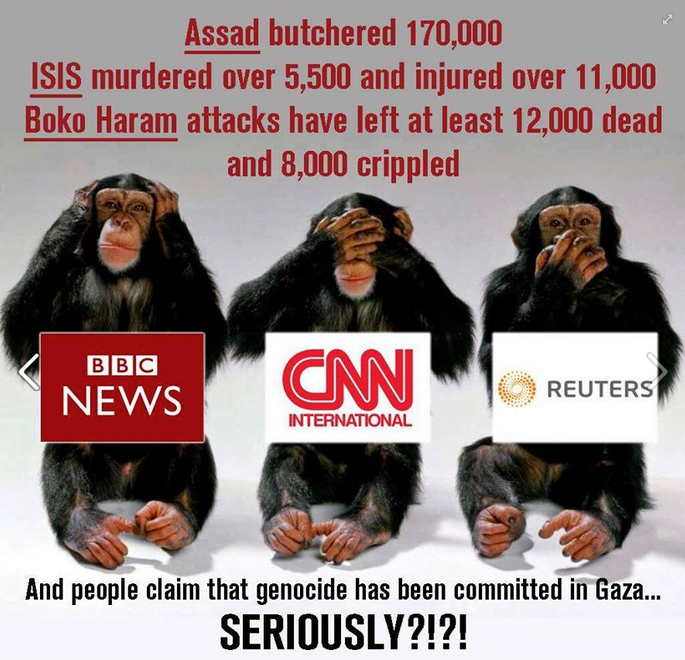 When you see this, you will ask yourself, “How many other funerals and corpses were also fake? They may claim that their campaign to boycott these companies is due to the fact that these companies are pro Zionist Israel, but some people suspect that there is a hidden agenda. Is it really an underhanded way of undermining Tan Sri Vincent Tan of the Berjaya Group? He owns the franchise for McDonald’s in Malaysia through Golden Arches Restaurants Sdn Bhd (GARSB). HOW COULD SUCH A WEALTHY MAN DEMAND SUCH A SACRIFICE FROM EMPLOYEES OF MCDONALD’S AND STARBUCKS? KUALA LUMPUR, Aug 13 — Workers of fast food giant McDonald’s Malaysia and coffee chain Starbucks were urged to resign to protest their employers’ alleged links to Israel by a Muslim consumer group, which said the act was “nothing” compared to atrocities against the Palestinians. According to Datuk Nadzim Johan of the Malaysian Muslim Consumers Association (PPIM), those who are reluctant to do so are only putting up “excuses” in their support for the Palestinians. “We can find other jobs. Don’t tell me you’re happy working for those who are killing our comrades?” Nadzim told Malay Mail Online after an anti-Israel rally in Taman Tasik Titiwangsa here during the weekend. He insisted that changing jobs is a minor effort compared to those who are sacrificing their lives in jihad, or holy struggle, in the Gaza. “We have to return to our faith, that fortune comes from Allah. We have to be confident in our belief,” he added. Most of the employees of McDonald’s are Muslim Malays. How do the children of McDonald’s staff feel when teachers warn students not to patroniseMcDonald’s? McDonald’s and its staff have experienced threatening telephone calls, physical intimidation, public humiliation and vandalism of property. Anger against McDonald’s following allegations that it contributes to Israel has resulted in a series of abuse and harassment for 12,000 of the fast food chain’s employees in Malaysia. In an impassioned plea for the harassment to stop, McDonald’s Malaysia’s managing director Stephen Chew said the abuse has been so bad that its staff are even being shunned when they go to the mosque. Some of the 85 percent of staff who are Muslim have even opted not to return home to their hometowns for Hari Raya Aidilfitri for fear of ridicule over their employment at family gatherings. He added that children of McDonald’s staff are also being singled out in school when teachers warn students not to patronise the restaurants in the nationwide boycott over claims of Israel links which McDonald’s has denied. 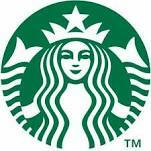 Starbucks: We Don’t Give Money To Israel http://huff.to/1zYk7Q2 via @HuffPostPol. @StarbucksMY should issue a statement too. Soon. so, in Malaysia, I have to remove my car’s McDonald’s and Starbucks sticker in order to save my windshield from being smashed? 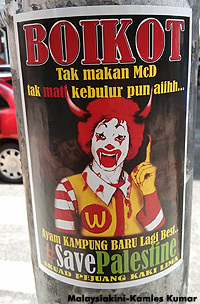 KUALA LUMPUR, Aug 10 — Fast food franchise McDonald’s, coffee chain Starbucks, and British bank HSBC are the three businesses that will be targeted in a concerted boycott by Muslim NGOs, as they launched a month-long campaign called Bulan Kemarahan Ummah (The Month of Ummah’s Wrath) today. The Muslim NGOs vowed to undertake “peaceful boycotts” against the three companies as part of the anti-Israel campaign, but also named soft drink brand Coca-Cola and Swiss multinational firm Nestlé as other companies to be boycotted by Muslims. According to the campaign, the brands will be boycotted because they allegedly “lend their support to Zionist Israel”. “As a rule, we don’t want boycotters to vandalise, hurt the feelings, or do things that will backfire … Don’t do things that others can use to mock our campaign,” said Abdullah Zaik Abd Rahman, the chief executive of Pro-Palestine group Aman Palestin which spearheaded the campaign. However, Abdullah said mass protests outside restaurants or outlets by holding up placards and lobbying customers are fine in order to raise awareness. This entry was posted in Uncategorized and tagged anti Israel boycotts in Malaysia, coca cola, HSBC, McDonald's, Muslim NGOs boycott, Nestle, Starbucks. Bookmark the permalink.